Need a quick, no fuss Halloween costume? Try this free cat ears knitting pattern! I love Halloween, don’t you? Even though I love to dress up, sometimes a party or event takes me by surprise. In those moments, I always wish I had something quick and easy I could whip up – so I designed these super simple cat ears that almost any knitter could make. I chose Classic Elite Yarns Ava, a DK weight wool yarn with a hint of sparkle. What better excuse than Halloween to break out some sparkly yarn? In true Halloween fashion, I chose to make black cat ears, using Ebony (6813) and Blush (6816). If you’d rather make a ginger cat, you could use Jus de Carrotte (6885)! I loved working with this yarn, it’s softer than any other sparkly yarn that I’ve found. They have a wide range of shades, and the leftovers from this project have endless possibilities – a scarf, mittens, more cat ears? Everyone who has seen the ears loves them, so maybe I’ll just end up making cat ears for the whole office. I used 3.5 mm (US 5) needles. This project is knit flat, but I knit it back and forth on circular needles to save on elbow room when commuting. Repeat rows 3 and 4 until you have 6 stitches left, and then purl a row. Now, you’ll begin increases again. Purl a row (row 14), then continue. Repeat row 19 and 20 until you have 16 stitches on the needle. Cast off and seam up sides, leaving the base of the triangle open. Using your pink yarn, cast on 9 stitches. Repeat rows 3 and 4 until you have 5 stitches left, and then purl a row (row 6). Cast off, and using running stitch, sew to one side of each outer ear. Next, position one ear where you’d like it to be on the headband. Using a yarn needle, sew through the ear and around the headband. Continue in this manner until the entire ear is sewn onto the headband, and repeat for the other ear. Even Bingo the springer spaniel got to try out wearing the cat ears (for about 90 seconds, until he got bored). 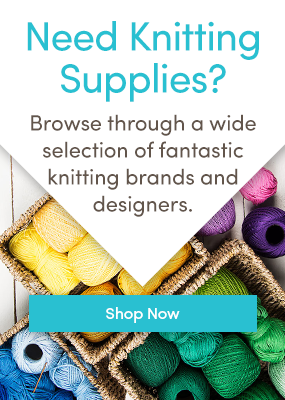 Enjoy your ears – happy knitting! Craving more free patterns and inspiration? Follow us on Bloglovin’ and never miss a post!